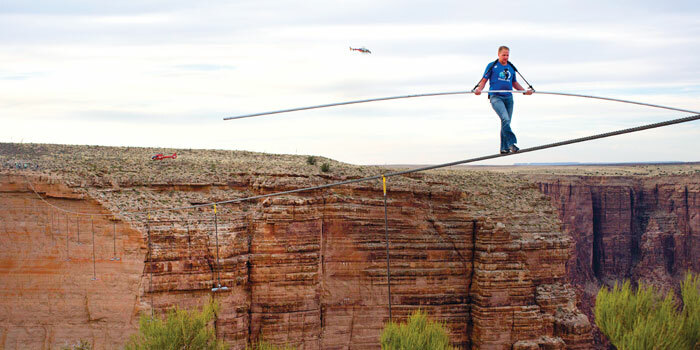 Hea��s THE seventh generation of the daredevil Wallenda family in stunts, but Nik Wallenda is certainly making waves. The first person to cross the Grand Canyon and the Niagra Falls on a wire, in true family tradition,without a safety net, harness and completely untethered, he heads to the Windy City, Chicago. There he will walk from Marina City and back on a rope 5/8 of an inch. a�?So I will be walking at an incline of over 15 degrees the entire time which makes it very, very challenging because it takes more endurance,a�? he begins. Stunts come naturally to him he tells us. a�?My great grandfather, Karl Wallenda, is a huge inspiration to me. He paved the way. I never had the opportunity to meet him. But I believe a lot of my dreams and visions come from him. And my parents who have taught me everything I know,a�? shares the daredevil, who started out at two, as a clown in a circus walking on wire even then. Telling us more of his upcoming Chicago escapades, it seems that Wallenda needs more of a challenge, which is why he is set to prance along the skyline blindfolded. a�?I didna��t think it was possible to walk blindfolded! But I had to do something in addition to just this incline walk over the city… something that would grab the attention of viewers and set Twitter and Facebook on fire!a�? says the American, adding that ita��s about carrying on a legacy, and doing things that are a�?bigger and grandera��. Taking us through the mind of a stunt performer, Wallenda explains that while he is always very excited, there are some nerves too. a�?Ita��s about being up here, getting acclimated with the surroundings and getting used to sirens, car horns and other distractions in a city,a�? he admits, hinting that these will be some of the difficulties hea��ll face in Chicago. Apart from the gusty winds at 48 mph! But as the first to walk across the Grand Canyon, (his dream come true), wea��re sure ita��ll just be a walk in the park for this daredevil! Most dangerous stunt: Chicago. Uphill, windy and blindfolded! A stunt youa��re most proud of: Puerto Rico. I walked across the towers at the Condado Plaza Hotel in San Juan where my great grandfather lost his life. Mental preparation: The physical part comes naturally now. But mind needs a lot of meditating and being positive. Passing on the legacy: Despite what people think, I want my kids to do what they desire, be it this or becoming a doctor or lawyer. Advice for aspiring daredevils: Whata�� ever your dreams, you can accomplish anything if you set your mind to it.